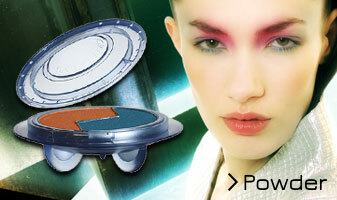 Rocket Lipsticks and flying saucer Face Powders by acclaimed make-up artist Glauca Rossi. 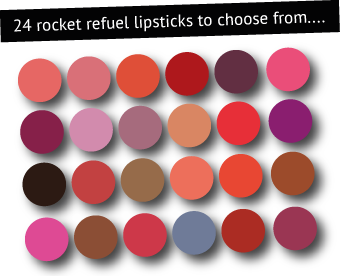 Our state of the art Lipsticks in a rocket carry case are naturally moisture rich and highly pigmented, giving you the long lasting, hydrating colour you had never thought possible…well not in this dimension anyway! The tone on tone technology of our lipsticks leave you to decide the impact; so for more intensity just apply another layer. The wide range of colours and finishes (including gloss), all Make-up Artist quality, ensure you’ll want to try every one. 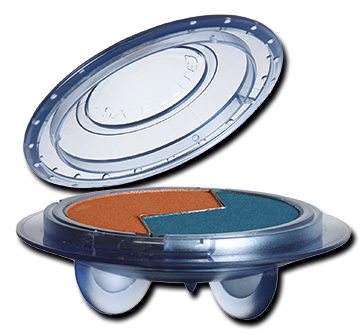 Our state of the art Face Powders (which can be added 2 at a time to the flying saucer carry case) are highly pigmented, guaranteeing great coverage on all skin types. The micro fine texture of the mineral rich powder means patchy coverage is a thing of the past and blendability is not only reserved for trained Make-up Artists. You too can achieve vibrant and beautifully diffused colour, with our (Make-up Artist quality) Face Powders. 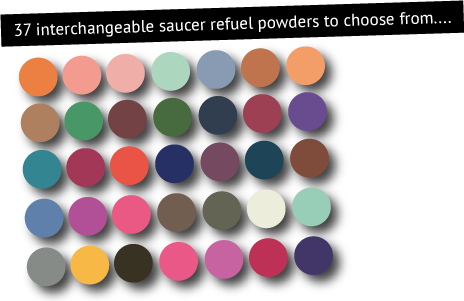 It makes good sense to take off with a sensible selection of our interchangeable colour powder inserts in your back pack. Naturally, no mechanical help is required to slip any two Satellite3 colours into your Saucer. At Satellite3 we are passionate about providing great value make-up artist quality cosmetics whilst minimising environmental impact. Unlike other cosmetics, ours Satellite3 range is refillable, which means once you have purchased our unique Rocket Lipstick and Saucer Face Powder once, you can save money (and the environment) by only needing to purchase the refills thereafter. Additionally, our face powder refills are much larger than what is usually available, making them even greater value! Click to Buy the Rocket or Buy the Saucer.